When it comes to seasonal fall desserts, apple pie is certainly a classic. 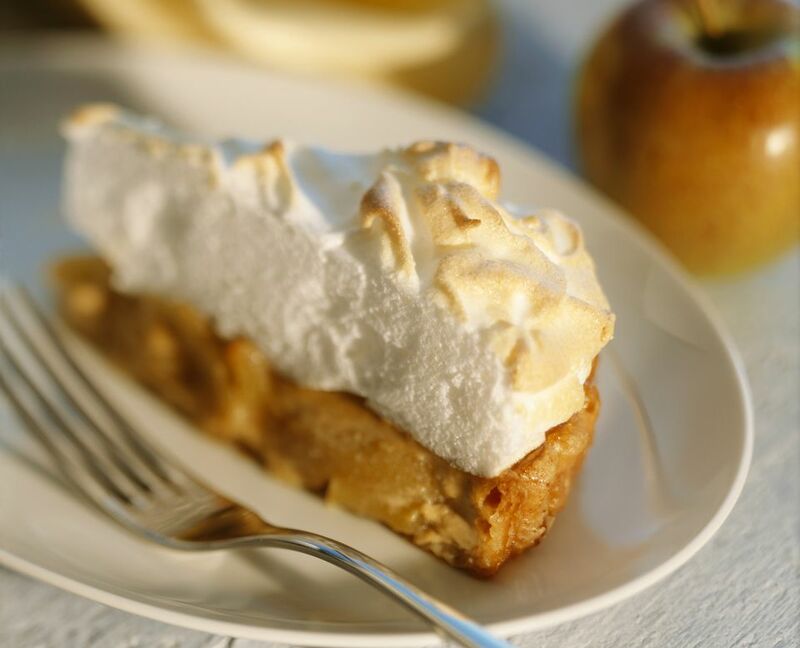 This one gets dressed up with a lofty meringue topping, which makes it perfect for fall holidays such as Rosh Hashana or Thanksgiving. It's also dairy free, which is a boon if you're serving a kosher meat meal, or if you're feeding a crowd and need to cater to food sensitivities or allergies. Preheat the oven to 350° Fahrenheit (180° Celsius). Grease a 9-inch pie plate, or spray with non-stick spray. Separate the eggs and set aside. In a large bowl, whisk together the flour, sugar, and baking powder. In another large bowl using electric beaters, or in a stand mixer fitted with a with a paddle attachment, cream together the margarine, egg yolks, and vanilla until fluffy. Add the flour mixture and continue beating until the dough begins to pull together. If necessary, add water, 1 tablespoon at a time, until the dough pulls into a ball. Shape the dough into a disk. With a floured rolling pin, roll out the dough on a lightly floured surface. Transfer the dough to the pie plate, pressing gently into the bottom and up the sides of the pan. Prick the bottom of the crust with all over with a fork. Bake in the preheated oven for about 20 minutes, until the crust is golden. Remove the crust from the oven and set aside, but leave the oven on. In a medium saucepan, melt the tablespoon of margarine. Add the apples, sugar, and cinnamon, stirring to coat. Cover and cook over medium heat until the apples are softened, but not mushy. Using a slotted spoon, transfer the apples into the baked pie crust, discarding any juices left in the pan. Gently spread the meringue over the apple filling, extending it over the pie crust edges to seal in the filling. Return the pie to the oven and bake for about 20-30 minutes, until the meringue is golden. Cool on a wire rack. Store any leftover pie in the refrigerator. Need a time saver? Use a ready-made pie crust instead of making your own. No need your dessert to be dairy-free? Swap the margarine for unsalted butter. After separating the eggs, allow the whites to stand at room temperature for about 30 minutes, while you prepare the crust and apple filling. You'll have an easier time whipping the whites if they're not refrigerator-cold, and your meringue will be more voluminous.